Utilizing our latest machines and high tech tools, we have cemented ourselves as a top Manufacturer and Supplier in the industry. We offer Portable Bathroom to our admired customers at nominal price. This economically viable product is 100% maintenance free. It is independent of costly and limited conventional energy sources. It is easy to install, economical to replace septic tank and eco friendly as well. 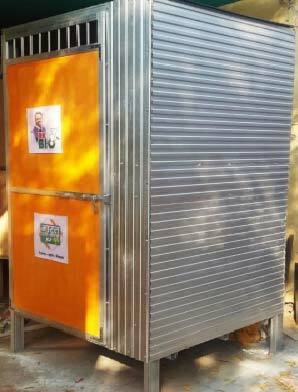 More About Portable Bathroom : We are manufacturer of Bioactive simple just fit and forget design bio toilet and Bio Digester Realizing the dreams of a clean and serene India.... introducing new environment friendly mosquito repelling and most economical bio toilet. Eco friendly-no pollution repeals mosquito larva repels flies odorless slurry provision for bio gas Generation. No dependence on the limited and costly conventional energy sources. An be installed and made operational in very less time compare to other technologies. Inoculums charging is only once during the entire life. No disposal of sludge is required. Routine cleaning chemicals like phenyl, soap, kerosene etc. do not use acid for cleaning.